Situated in the heart of Johor Bahru, this hotel overlooks the Straits of Johor and is just off the Causeway from Singapore. Danga Bay and KSL City Shopping Mall are both about a 10-minute drive away. Guests can enjoy a sprawling outdoor pool featuring 2 levels and romantic water bridges. Also offered are 2 multi-cuisine restaurants, a bar, and a fitness center with a gym. Thistle Johor Bahru's 382 accommodations boast views of the Straits of Johor, the city, or the pool. Rooms are equipped with air conditioning and high-definition televisions with satellite channels. Overlooking the Straits of Johor, which separate Malaysia and Singapore, this 4.5-star hotel is a luxurious stop for the business or leisure traveler. Thistle Johor Bahru features a 2-level freeform pool with romantic water bridges, as well as a separate children's pool. Sports facilities includes 2 tennis courts and a gym. The hotel provides a complimentary shuttle to nearby shopping areas, tourist destinations, and to Legoland Malaysia. A roundrip airport shuttle is also available for a fee and with 24-hour advance notice. 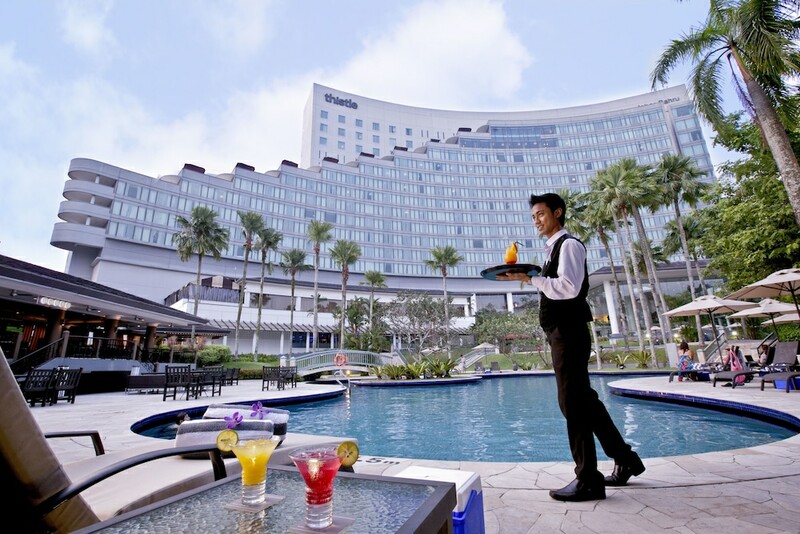 Dining options at this Johor Bahru hotel include a buffet-style restaurant serving an array of international and local dishes, and Oasis, a poolside bistro featuring Italian and Japanese cuisine. Guests can enjoy light fare and cocktails at the stylish lobby lounge. A buffet breakfast is served in the restaurant for a surcharge, and 24-hour room service is available. Free parking and complimentary wireless Internet access are available throughout the hotel. Glass - Overlooking the pool, this restaurant serves a wide variety of international and local cuisines. Both a buffet and an à la carte menu are available. Open daily from 6 AM - 1 AM. Steps - Guests can enjoy light snacks and cocktails at this stylish lobby lounge. English high tea is available in the afternoons, and live performances take place most evenings. Open daily from 11 AM - 1 AM. Oasis - An innovative menu including Japanese teppanyaki and Italian fusion cuisine is served up at this restaurant overlooking the pool and gardens. An open kitchen makes for a unique dining experience. Open daily from 5 - 11 PM. Guests can enjoy a 2-level outdoor pool with romantic water bridges. A separate children's pool includes a water slide. The Clark Hatch Fitness Centre features 2 outdoor tennis courts and a gym with cardiovascular and weight machines. Fitness classes are offered in the gym, including aerobics, Pilates, and Muay Thai. A sauna, steam room, and spa tub are available, as well as separate locker rooms for men and women.